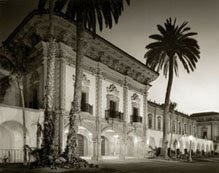 When I lived in San Diego a few years ago one of our neighbors was very involved in The Museum of Photographic Images (http://www.mopa.org/) which is in the Casa de Balboa building at the exquisite Balboa Park, one of San Diego's most captivating of places. I had never been to a museum devoted to photography although I'd always had a bit of interest in photography. I joined the museum and would visit periodically. And then an exhibition came that completely mesmerized me. 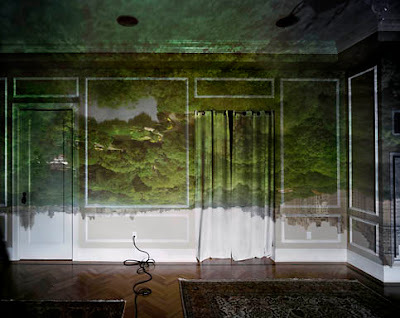 The exhibition was photographer Abelardo Morrell's "Camera Obscura." Camera Obscura, and I didn't know a thing about this, was a device that was invented by a Persian around 1000 AD which eventually led to photography. 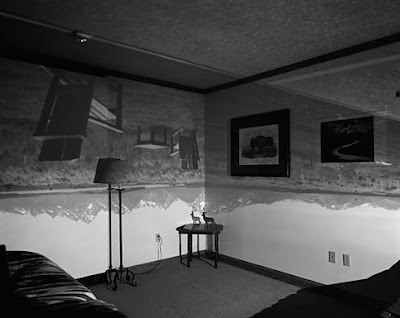 The camera obscura (Latin veiled chamber) is an optical device used, for example, in drawing or for entertainment. It is one of the inventions leading to photography. The principle can be demonstrated with a box with a hole in one side (the box may be room-sized, or hangar sized). 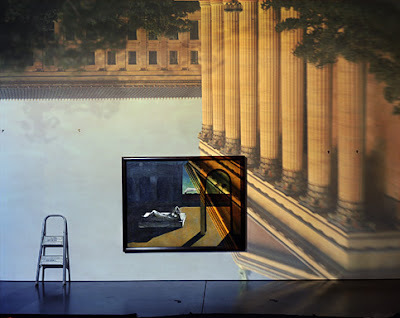 Light from a scene passes through the hole and strikes a surface where it is reproduced, in color, and upside-down. The image's perspective is accurate. The image can be projected onto paper, which when traced can produce a highly accurate representation. 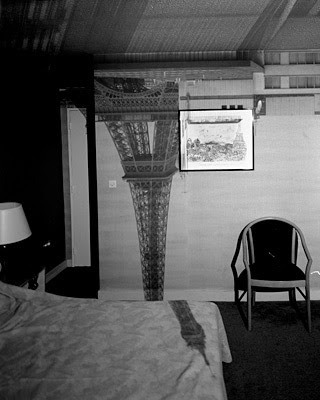 Using mirrors, as in the 18th century overhead version (illustrated in the Discovery and Origins section below), it is possible to project a right-side-up image. 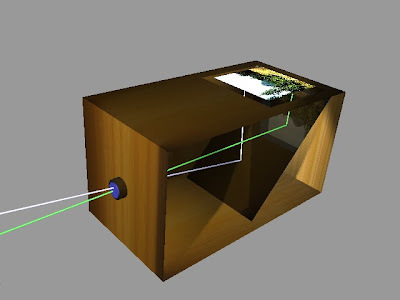 Another more portable type is a box with an angled mirror projecting onto tracing paper placed on the glass top, the image upright as viewed from the back. 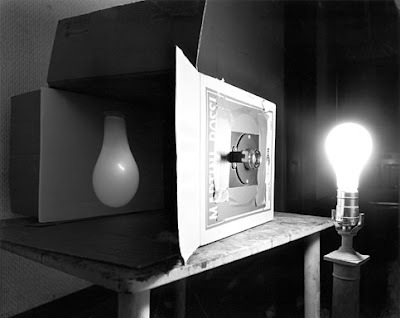 As a pinhole is made smaller, the image gets sharper, but the projected image becomes dimmer. With too small a pinhole the sharpness again becomes worse due to diffraction. Some practical camera obscurae use a lens rather than a pinhole because it allows a larger aperture, giving a usable brightness while maintaining focus. 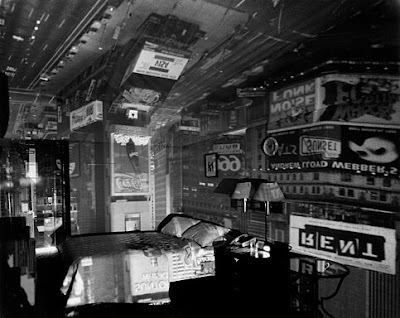 At the exhibition they had a walk-in camera obscura where you could observe the phenomenon yourself. The complicated set up and length of time it takes to capture these images, in so many different settings, is as elaborate as can be although the images themselves are beautiful in their simplicity. 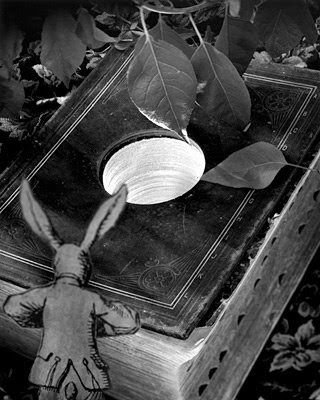 I especially enjoyed his Alice In Wonderland series and the Book series! If you're like me I just can't get enough of the beauty that this guy creates. 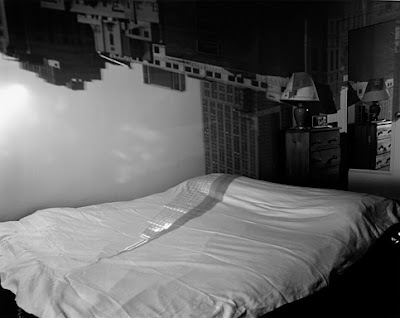 Please visit Abelardo Morell's website at http://www.abelardomorell.net/photography/recent_01/recent_01.html to see the rest of his work. And please check out one of his exhibitions if it comes to your town.